Equipment commonly utilized in drawing blood will vary depending on facility setup, size of fish being tested, and individual preferences. The following list outlines equipment and supplies found helpful followed by a more detailed description of some less famalier items. Nets, socks or vinyl bags of appropriate size for the fish being tested. Minimun of three containers for aerated water, one for anesthesia, a shallow tub for drawing blood, and a tub for measuring fish size, photography, and recovery. Air stones and air supply for aeration of water containers. Lumbar puncture needles may be helpful for drawing blood from massive fish (3 1/2 inch 22 gauge pediatric). Two inch SS needles used for livestock also work. Ice bath, ice pack or other means of keeping sample tubes cool after samples are collected. Disinfection solution for equipment. Household bleach is readily availble and very effective but it is hard on nets and must be well rinsed. 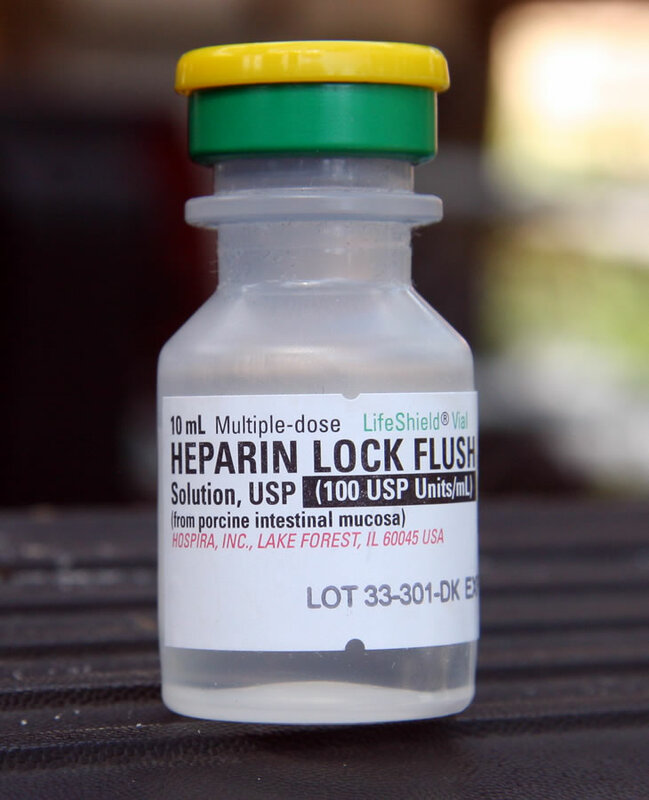 Sodium or lithium heparin solution is not essential but may prove helpful, especially if using small needles on small fish. 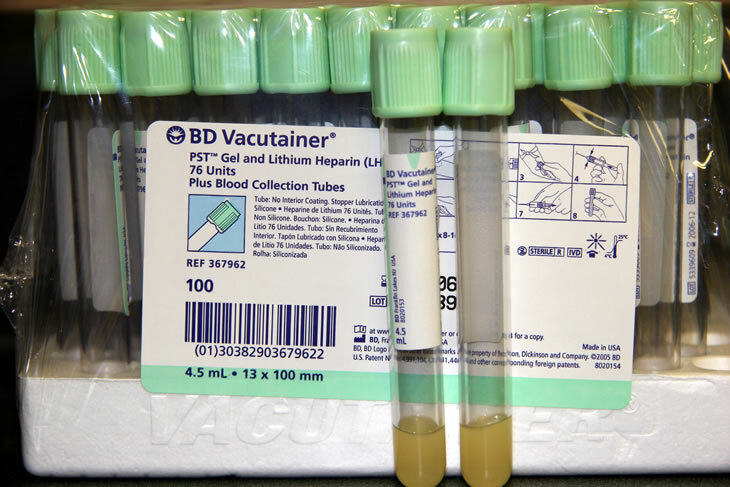 Sterile water may be used if lithium is obtained form lithium heparin vacutainers (light green top). Some may wish to have a microscope, slides and cover slips available for scraping fish after they are caught but before they are placed in anesthesia solution. Supplies for treating unexpected skin lesions, parasites, or other problems discoved when the fish is examined under anesthesia may be useful. For those which may be unfamalier with some of the supplies commonly used, more detail and photos follow. The photo size is large such that labels can be readily read. When drawing blood for testing for the presence of antibody to KHV by the sensitive VN (virus neutralization) method, it should be remember the sample will be grown in tissue culture with the KHV. Precautions shoud be taken to keep samples sterile when possible. 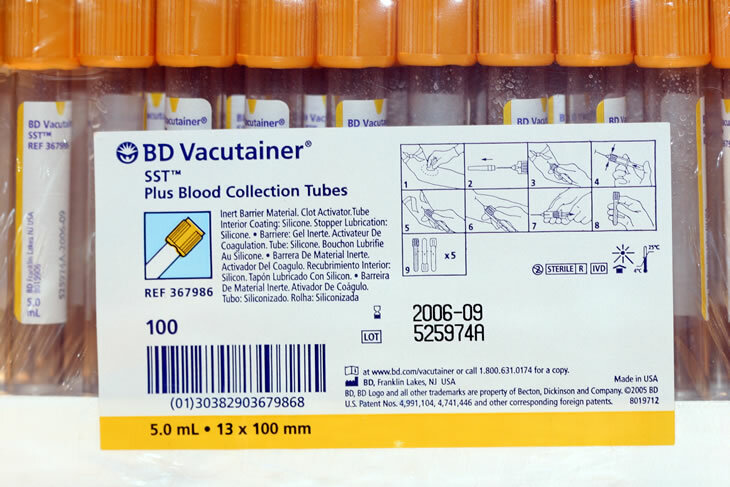 Vacutainers are sterile tubes with a rubber top. Contents in the tubes vary as does the color of the cap. Tubes also vary in size. Some tubes have an inert gel in the bottom of the tube. 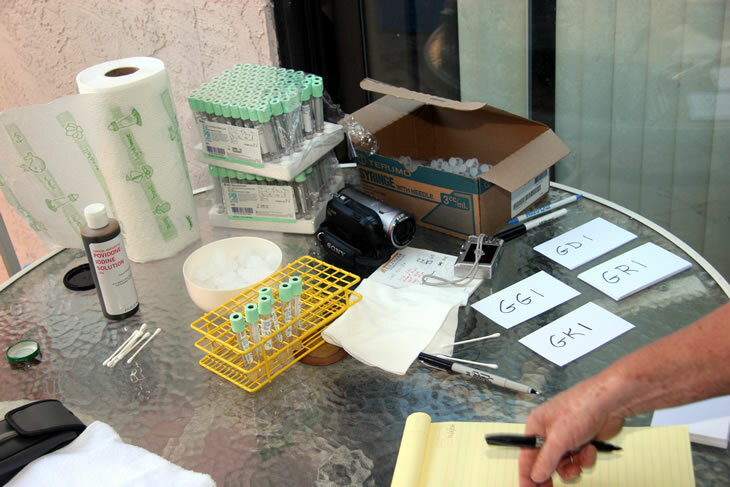 Our sample size will typically be about 1 ml although 0.5 ml may be utilized from smaller fish. The 4.5 ml or 5 ml vacutainer tubes are reasonably economical and work well for this purpose, assuming the syring plunger is initally held when the sample is transferred to the tube (prevent hemolysis). Serum or plasma gel tubes are appropriate. The gel in the tube allows separation of the red cells from serum or plasma when the sample is centrifughed. 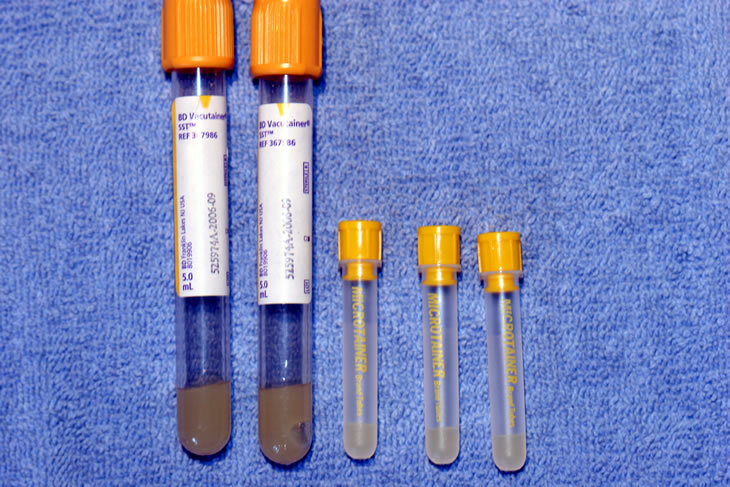 Serum gel tubes usually have a gold top or an all red top. Plasma gel tubes (containing lithium heparin) usually have a light green top. Serum and plasma gel tubes are frequently utilized in physician and veterinarian offices although all may not have the smaller sizes. The gel in the tube allows separation of the red cells from serum or plasma when the sample is centrifughed. Tubes may also be ordered from medical supply houses. They are inexpensive in quanity. Gold stoppered serum gel tubes, sterile. Red topped tubes with gel are also available. Sterile plasma tubes containing gel and lithium heparin. Microtainers are utilized in cases where only small quanities of blood are obtained. 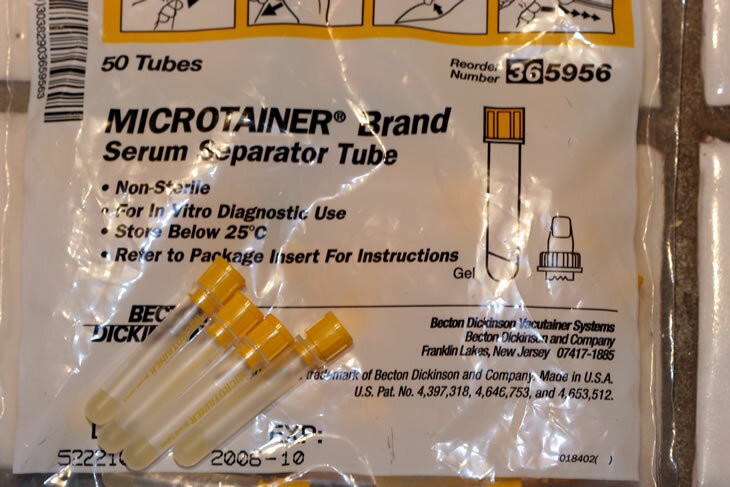 Microtaines also come as serum or plasma gel tubes. They are not sterile and the manufacturer does not recommend sterilzation. They usually come in packages of fifty. When the package is first opened, care must be taken to put the caps on each of the tubes without placing one's fingers on that portion of the cap which will fit inside the tube. Microtainers are more expensive than vacutainers. Microtaines may be "spun down" in centriuges used for vacutainers. Microtainer tubes with gel. They also are available as plasma tubes with gel. None of the microtainers are sterile. Vacutainers and Microtainers size comparison. Some vacutainers are much larger. Smaller sizes are more desirable. A number of brands of centrifuges are available for "spinning down" the blood. Some centriuges are utilized for very small tubes of blood and are not really suitable for our purpose. Six tube centrifuges commonly utilized in medical and veterinay practices have proven useful. 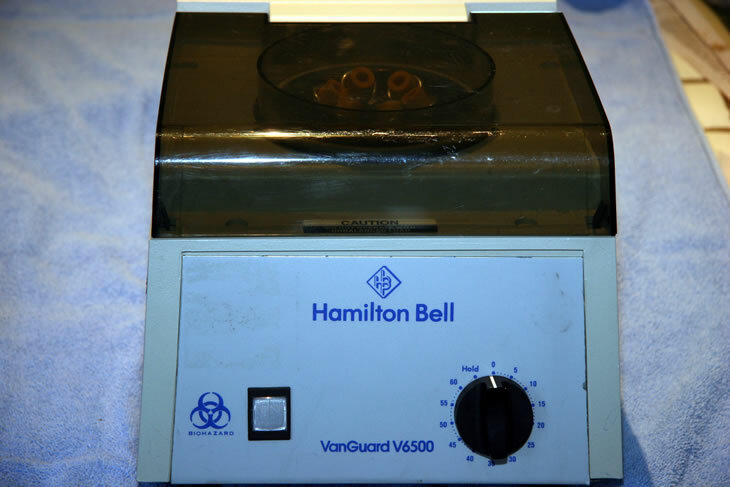 An example of a common relatively inexpensive centrifuge appropriate for our purposes is the Hamilton Bell Vanguard 6500. Hamilton Bell distributes the Vanguard 6500 under different labels (i.e. Quest Diagnostics Vanguard 6500) ,available used on Ebay. Frequently the timer dies on older models and they must be manually stopped by turning the switch. Blood is usually spun for 10 -15 minutes. If blood remains in a spinning centrifuge for prolonged periods, it may become warmer than desired. Six tube centrifuge suitable for separating red cells from serum or plasma prior to shipping sample for KHV serology. 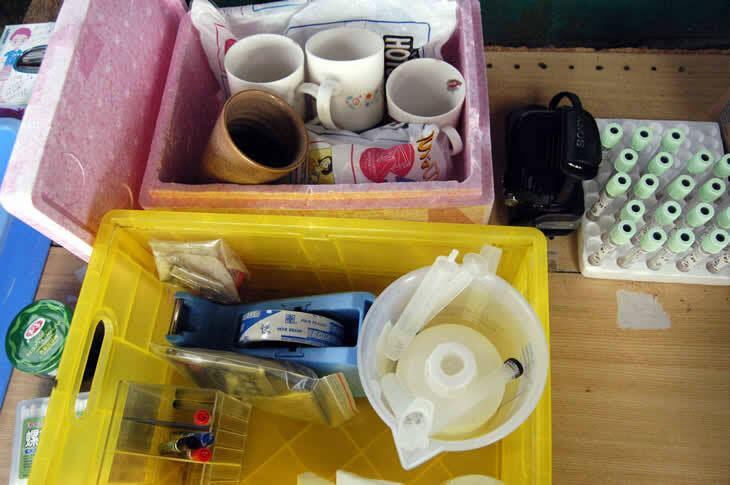 Typical dry supply setups for drawing blood..
Materials we find helpful include nets and bowls, at least three aerated Rubbermaid containers of water (for anesthesia, blood drawing, and recovery), a towel, paper and ballpoint, Sharpie, a digital camera, medical supplies if needed, microscope and slides for scraping (before anesthesia), anesthetic agent of choice, appropriate needles and syringes, vacutainers or microtainers, centrifuge, ice bucket, and disinfectant solution for nets and tubs. Some recommend the use of sodium or lithium heparin to coat the inside of the needle and syringe prior to venipuncture. In our experience this is of benefit when using a 25 gauge needle on small fish. If a multidose vial of heparin (100 units/ml), 2 ml of bacterialstatic water may be injected into a light green topped plasma tube and utilized for flushing syringes prior to venipuncture. Note the high tech coffee cups on ice packs utilized to keep samples cool before centrifugation. Heparin is optional. If used, the new sterile syringe needle is placed in the vial, the vial is inverted, herparin is drawn into the syringe and then the plunger is depressed with heparin returned to the vial. the needle is then withdrawn and capped. This causes the needle and needle hub to be coated with a small amount of heparin which may prevent clotting in a difficult draw. 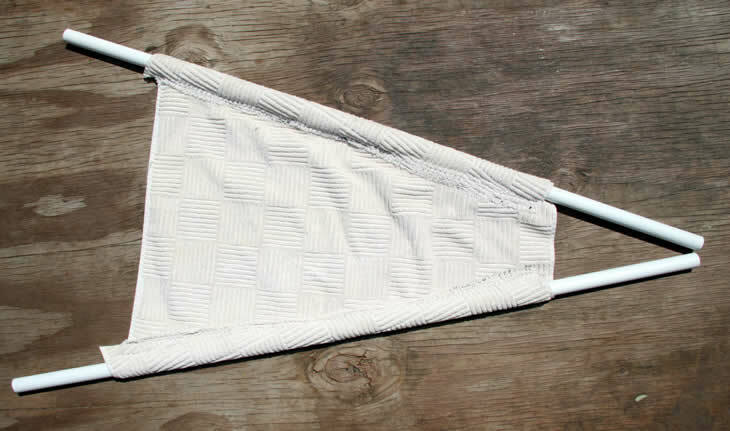 This novel device made of PVC pipe and an old towel was developed by Tom Hatfield of Koistuff as an aid to supporting the koi in water while drawing blood. The pvc pipe rests on the container lip and the towel is wet and immersed in water, supporting the upside down koi.